Here are a few recent events that may be of interest. Clinic Change Drive - Can You Spare Some Change? Our free clinic serves an average of 167+ patients per month and is supported by a staff of volunteer physicians, nurses and other healthcare professionals who generously provide care to our patients. Most of the medication we dispense is purchased through a pharmacy called MedShare. The MedShare pharmacy serves the 14 free clinics in Greater Milwaukee by supplying medications at a greatly reduced cost. These medications are crucial to the health and even the very life of our patients. Thanks to MedShare, our medical clinic can regularly supply non-narcotic drugs from cough syrup to insulin for a variety of illnesses and conditions. It is only through your generous donations that we are able to purchase the discounted drugs and clinic supplies needed to continue serving our patients. At this time, our MedShare fund is dangerously low. To fill the gap, Repairers of the Breach is running a change drive to help raise funds for medication expenses and also to raise awareness of the many people we serve in our community. At this time we are asking that everyone consider donating your extra change to our clinic. When you clean your couch cushions or car, consider the help you can give to a person in need. On Monday, May 29, 2014, Repairers of the Breach served a hearty Memorial Day picnic lunch in our Peace Garden between 11:30 a.m. and 1:30 p.m. Widely advertised to the community, as many as 250 homeless and at-risk men and women enjoyed safety, satiety and, most of all, SMILING! On March 20, 2014 Executive Director Pastor James West, Jr. was the guest speaker at a meeting held by Community Shares of Greater Milwaukee. The invitation provided him with the opportunity to personally meet their members and describe the 2014-2015 goals for Repairers of the Breach being developed through the strategic planning process. The very positive and productive question and answer period provided future collaborative plans for members of the Community Shares organization to work closely with Repairers of the Breach. On March 15 and 16, Executive Director Pastor James West, Jr. and two of our homeless members were honored guests at St. Mary's Parish in Hales Corners. Pastor West spoke at the end of three Liturgies, and one of our homeless members spoke at the last mass. After a congenial "social" with parishioners, clergy, and staff, Repairers' members were given 30 bags of specific requested items for the medical clinic and center, along with a generous monetary donation exceeding $4000. Arrangements for future bag lunches, homemade casseroles, scripture sharing, and volunteering at Repairers were also made. Pastor West accepted an invitation to take part in a Tuesday evening adult scripture study class at St. Mary’s conducted by their own Pastor Chuck Schramm. Friday evening, March 14, 2014, Executive Director Pastor James West, Jr. and a homeless member-representative of Repairers of the Breach attended a "Box Night" at Catholic Memorial High School in Waukesha. According to their website, Operation Michael began in 1998 when a senior named Juan had a life-changing encounter with a homeless man named Michael, holding a sign like the one pictured at left. This awareness-building program expanded seven years ago to include fundraising to benefit homeless people in the community. "Members [of Operation Michael] do works of service and justice by participating in clothing and supply drives, volunteering at meal programs and shelters, and fundraising in order to aid the homeless in our community. This night is set aside for us to reflect and pray while engaging in different activities that are focused and centered on the homeless." Thanks to faith and compassion in action, this amazing group of young people donated $2,000 to the work of Repairers of the Breach, which emphasizes "homeless helping homeless"—with help from the community. Young Emma Gottschalk turned 12 on Friday, March 14th. She wasn't hoping for the usual presents that come in a box with a bow. She asked everyone she knows--and even those she didn't—to give a gift of charity instead. This remarkable girl has been "birthday sharing" since 2008, with a special Facebook page devoted to the benefit of others on her birthday. This year, Emma's gift benefits Repairers of the Breach, and we couldn't be more grateful. We're happy to report that Emma raised $1,700 for her birthday wish. Thank you for your selfless gift, Emma! Soup & Soul Event - Good Friends, Music, Soup and Beer! 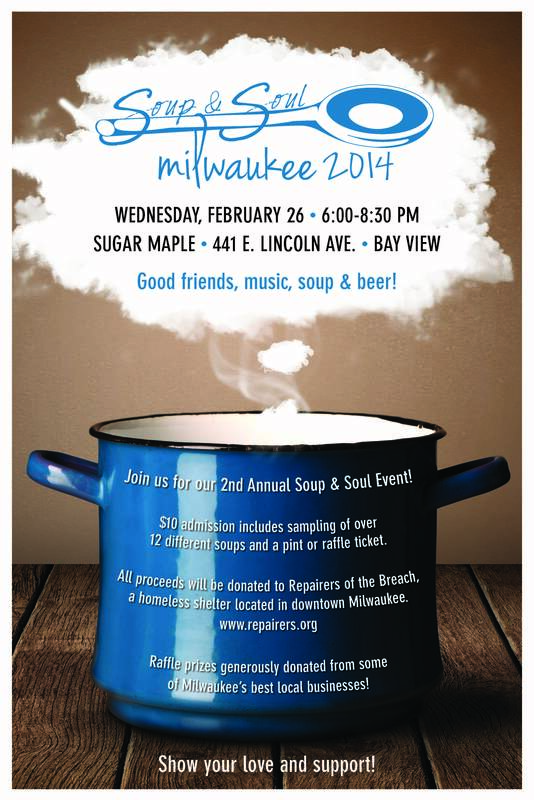 The 2nd Annual Soup & Soul Event was held Wednesday, February 26, 2014 at Sugar Maple, 441 E. Lincoln Ave. in Bay View. The $10 admission included a sampling of more than 12 different healthy and delicious soups and a pint of American Craft Beer or a raffle ticket. Raffle prizes were generously donated by some of Milwaukee's best local businesses. This wonderful event raised more than $2,800 for Repairers of the Breach! We offer our great appreciation to all those who worked so hard to organize and orchestrate all segments of the Soup & Soul Event. Outpost Natural Foods sponsored a Community Information Fair and Annual Meeting on Sunday, February 16, 2014 at the Tripoli Shrine Center (3000 W. Wisconsin Ave.) Representatives of Repairers of the Breach and other community agencies were on hand to answer questions about their vital programs. Outpost's lively annual meeting of co-op owners began mid-afternoon., with participation from several hundred owners.